For the last while, I’ve been thinking about the fact that the Mosaic Browser was released 20 years ago this year. It would have been 21 next year. Netscape was released 19 years ago. Notwithstanding Tim Burners-Lee’s seminal work essentially inventing the web at CERN in 1989, the Mosaic browser, to me, marks the beginning of an open and publicly accessible web. So all of this makes 2014 a significant year for the World Wide Web. It will be 25 years old, if we count from Berners-Lee’s initial release of the idea at CERN, and a “publicly accessible” web (if one considers the Mosaic browser the first truly public manifestation of the World Wide Web) will have been around for 21 years. Last night, in New York I was super excited to attend the Rhizome hosted discussion with The Thing, “The Internet Before the Web: Preserving Early Networked Cultures“, at the New Museum as part of their New Silent series. In the 1990s I watched the work of The Thing from afar. I was peripherally involved in the Australian artists collective System X, who ran a dial up BBS which launched in 1990, and who still maintain the web presence of a few of the artists and projects that they hosted back then so have a particular interest in pre-web internet art. In fact as Australia gears up to host ISEA2013, it is worth looking back to TISEA in 1992, when as far as I am aware it was the first international (media) art festival to include internet art projects, including System X projects, represented founders by Jason Gee and Scot Art. 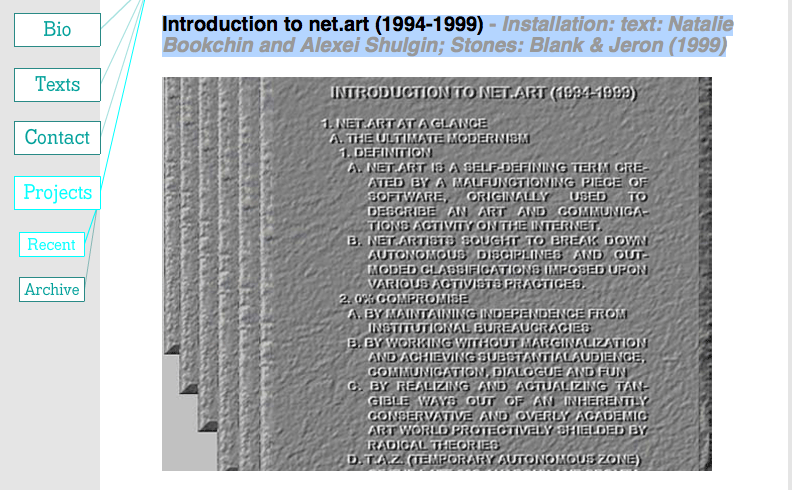 I’ve started to compile a bit of a bibliography about internet art. Of course there are dozens of articles about the topic, so this is really just a starting point. Back in the mid 1990s when I was doing my Masters in Art Administration at the College of Fine Arts in Sydney, Australia, I did my interships online with System X (in fact I have to own that authored the Soundsite pages as an intern in 1994 or 1995 using simpletext and Netscape Gold! ), and ArtsWire. It was an extremely novel idea to do an online internship at the time, but a lot of what I was working for my (never completed) Masters didn’t quite fit the traditional model of arts administration at the time. I was going to write about art on the internet back then, but didn’t quite get around to it. Many brilliant colleagues have done much better work since. So I’ve started to collect a few of these resources. I’d be thrilled if others would contribute more. In light of Rhizome’s pre-web discussion last night, panelist Jason Scott, Director of BBS Documentary provides a fantastic (if a little US-centric) overview of BBS culture. Staying with the US, I thought it would also be fun to review Judy Malloy’s great summary about Arts Wire: The Arts Online Beginning in 1992: Memories of Arts Wire. Wolfgang Staehle, founder of The Thing gave a brilliant and inspired overview of the foundations of this seminal online artist collective. I was especially moved by his remembrance of Hakim Bey’s Temporary Autonomous Zone which came out just one year prior and truly spoke to collective independent space for artists to own this new “virtual space”, if only for a moment. Rhizome’s Digital Conservator, Ben Fino-Radin should be commended for hosting a lively discussion, but especially for being instrumental in initiating the conservation of such important early internet art material. So, to some resources that follow on from this work. This is by no means comprehensive work. I’d love feedback and additions. Gallery 9, Steve Dietz, curator, Walker Art Center. Between 1997 and 2003, under the direction of Steve Dietz, Gallery 9 was a key venue for the exhibition and contextualization of Internet-based art. Screenarts was an Australian resource for online screen-based project 1998 – 2003. No longer online. Rhizome Artbase, founded in 1999, the Rhizome ArtBase is an online archive of new media art containing some 2155 art works, and growing. Robbin Murphy et al. artnetweb New York network of people and projects investigating new media in the practice of art. STATE an online exhibition platform [on tumblr] that featured new projects by artists who use the internet as a primary element in their work. June 2010 – July 2011.